Big Band Library: December 2007 "Big Band News"
In the 72nd annual Down Beat Readers Poll, The Count Basie Orchestra directed by Bill Hughes was chosen today's top "Big Band." "It's important to keep some representation of what the big band era was," Hughes told journalist Aaron Cohen. "We're trying to keep Basie's ideal going." Hughes later explained to writer Julie Riggott, "Music has changed tremendously over the years. There was a big band era, when big band was the same as rap groups now. It was just the music of the day." Yet decades later, it remains enjoyable. 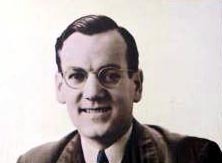 "The big band sound is still viable," Hughes said to Riggott. "It's not so involved that anybody with any kind of an ear doesn't pick up on that tap-your-foot routine. That's what Basie used to say, anyhow: 'As long as I look out there and see people tapping their feet, I know I'm doing my job' . . . So I kind of go by that, too." Besides discussing his passion for Basie's music, Hughes also respectfully spoke of him as a person. "Basie was a humble man and never pulled the celebrity type thing on you," he said to Cohen. "He was a fantastic human being." Congratulations to Mr. Hughes and each member of The Count Basie Orchestra for doing a great job! See and hear them live from December 1-16 on tour in Japan; on December 20th at Disney Concert Hall in Los Angeles, CA; from December 21-23 at the Anthology Jazz & Dinner Club in San Diego, CA; and December 26-31 at Yoshi's in San Francisco, CA. Apollo Theatre, Harlem, New York, NY. Tommy Dorsey Orchestra directed by Buddy Morrow: Dec. 31, Carlyle Club, Alexandria, VA.
Gene Krupa Orchestra directed by Michael Berkowitz: Dec. 3, Charley O's, Van Nuys, CA. Paltz, NY; Dec. 15, private, Mahwah, NJ. private, Arlington, VA; Dec. 22, Carlyle Club, Alexandria, VA.
photo © Count Basie Enterprises Inc. This month, author - lyricist Gene Lees concluded a seven-part series, "The Glenn Miller Years," in his Jazzletter. 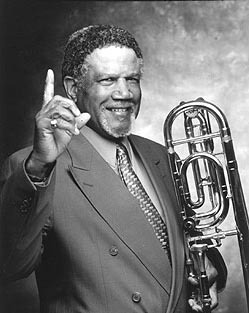 He dedicated the project to the late Artie Malvin, who sang with Miller's AAF band. Malvin had urged Lees to write something about Miller, commenting that "what has been written mostly isn't right." First comparing Miller to the classical composer Johann Strauss (known particularly for his waltzes), Lees traces Miller's career as leader of a beloved dance (rather than jazz) band, remarking that "no artist should ever be evaluated other than by his intention." Smith Ballew: "He was hard to know. He never bared his soul to anyone." Dave Dexter, Jr.: "Glenn was a nice man. A good middle-western man. He'd size you up . . . "
Gil Rodin: " . . . He had a helluva good sense of humor - I can still see that puckish grin - and he was a real gentleman. But when it came to his music he never took his eye off the ball . . . "
Jimmy McPartland: "You know, Glenn contributed a lot to the Pollack band. He was basically an idea man, and he certainly was a dedicated musician . . . "
Glenn Miller: "I remember following a man, with a trombone under his arm, until he went into a night club, and thinking my ambitions would be realized if I were good enough to work in that club." Mike Nidorf: "The greatest thing that ever happened to Glenn Miller was Helen Miller." Benny Goodman: "I gave him the money to get married. I'd forgotten about it until many years later when Glenn became famous and he said, 'Here's the money I owe you.' I didn't know what money he was talking about . . . "
Woody Herman: "Glenn had made a pact with his wife that he was through drinking. He couldn't drink, and he knew it. He would turn crazy . . . "
Billy May: "The rest of the time Glenn was kind of mad at the world. He was bitter about everything. Kind of a down kind of guy. Putting things down all the time . . . "
Tex Beneke: "I loved the man. He taught me so much about playing my own sax. And I knew he liked me. I could tell by the way he'd stare at me while I was playing a solo. He'd look at me and I'd look right back at him. It didn't bother me the way it bothered some of the others . . . "
Willie Schwartz: "He was a father figure to me. He had already been where I wanted to be . . . "
Marion Hutton: " . . . If he had told me to walk up Broadway naked, I would have. Of course, I was a people pleaser to begin with. But I was terribly afraid of incurring his wrath." Bill Finegan: "I used to complain about his continual editing of my arrangements. It was OK at first, when he had to cut it down to fit the tune onto one side of a record. But for a while Glenn would start editing just about everything, and soon it became a battle of wits between us. I would try to anticipate what he was going to do by black-penciling my own arrangements before he could. Finally he told me, 'You keep writing. I'll handle the black pencil.'" George T. Simon: "As I look back, I realize there may have even been an element of worship in my admiration. Later, I also learned to resent him." Ray McKinley: " . . . He had begun to act more like a tough business executive and less like a musician. He was getting more headstrong than ever, and less easy to get along with." Paul Tanner: " . . . As the band became more and more famous, his work load kept him occupied to the point that misunderstandings sometimes crept into his personal relationships." Jo Stafford: "The falling out between Tommy Dorsey and Glenn Miller had to do more with Tom Rockwell, who was head of the GAC talent agency. Tommy and Glenn were both his clients. And Tom Rockwell had led Dorsey to believe that he was going to get the fifteen-minute radio show for Chesterfield cigarettes. Tommy thought he had it. In the end-I don't remember the details of what happened-Glenn Miller got the show. So Tommy . . . decided that he hated both Tom Rockwell and Glenn Miller . . . "
Howie Richmond: " . . . Glenn Miller was very interested in the trade publications, the newspapers, the magazines. He read Down Beat. He read Metronome, and he thought whatever popularity they had was important for a band, even though it was restricted to a very small part of the public . . . "
Johnny Best: "Toward the end, when the band was losing popularity, I was walking across the street with him. We were playing the Stanley Theater. We were coming from the hotel. He had a hangover from the night before. Harry James was getting hot in record sales. He said, 'Now I know how Benny must have felt when Artie started coming up.'" Johnny Desmond: " . . . I found out that Miller was organizing this Air Force orchestra, so I wrote him a letter - which you're not supposed to do. You're supposed to go through channels, but I figured the channels would never get out of the base. I waited for an answer. Everybody laughed at me. Two weeks later I got a letter from Captain Glenn Miller . . . "
Al Klink: "I guess the best one-word description I've heard was that Glenn was G.I. - and that was before he was in the service." Guy Lombardo: "If Glenn had survived, I think he would still be in the music business, and it would be a better business for it." Mr. Lees' Jazzletter is available by subscription; he may be contacted at P.O. Box 240, Ojai, CA 93024-0240. Decca session), b.Dec. 31, 1917. Mitchell gigged with Gene Krupa from May to November of 1955 and stated, "I loved him. One of the nicest guys and an articulate musician." Mitchell also worked with Tex Beneke at Disneyland in 1965. Now age 75, Mitchell recently completed a 268-page autobiography, Hackensack to Hollywood: My Two Show Business Careers (Albany, GA: BearManor Media). Tommy Ryan, 86, guitarist-vocalist (Kaye '37-'42? ), d.Dec. 27, 2007, pancreatic and liver cancer. In late 1969, Guy Lombardo had a home built for him and his wife on a 7,000-square-foot lot in Florida just south of Tampa, in the small community of Apollo Beach, at 601 Flamingo Drive. Real estate speculator Lawrence Strominger, who bought the house in 2003 for $440,000, has now listed it for $1.49 million. "The home has been updated with crown molding, soft paint, ceiling fans and tile the color of sand," staff writer Ben Montgomery reported in the St. Petersburg Times. "But the swank still exists. One hallway ends at a sauna. One wall in the master bedroom is made of stone, one of mirrors. A wet bar is partly submerged in the grand ballroom, not far from the maid's quarters and the media room." A liberal arts major and 1958 graduate of Oberlin College in Ohio, James "Jim" Neumann really enjoyed jazz. As a teenager, he started buying jazz LPs (many of which are now expensive collectors' items), assembling everything possible by Charlie Parker, Dizzy Gillespie, and others. Eventually, he acquired a total of more than 100,000 records, including all styles of jazz from New Orleans to avant-garde - with an emphasis in modern jazz of the '40s and '50s - along with books, magazines, programs, posters, autographs, and other materials. It was, according to reports, "the largest privately-held jazz record collection in America." But now, Neumann, of Chicago, has decided to donate it to Oberlin College. Plans are to open a new building on the Oberlin campus in 2009, to house their Conservatory of Music’s jazz studies department and academic programs in music history and music theory. Neumann's collection will be a cornerstone, and Molly Johnson has been named its new Curator. granddaughter of bandleader Ben Selvin ]. [ including the cessation of the UK CD labels Pulse and Living Era ]. Dec. 17, 2007 [ review of Mosaic MD5-238 ]. Horace Meunier Harris, "The 2007 [ IAJRC ] Chicago Convention, A Swinging Success,"
IAJRC Journal, Vol. 40 No.4 - Dec. 2007, pp.7-9. Michael Highton, "Band Review: The Glenn Miller [ UK ] Orchestra directed by Ray McVay,"
Moonlight Serenader, Number 315 / 5th Edition 2007, pp.8-9. at the University of Missouri-Kansas City's Marr Sound Archives ]. Band in China," Moonlight Serenader, Number 315 / 5th Edition 2007, pp.6-7. Number 315 / 5th Edition 2007, p1+. chicagotribune.com, Dec. 14, 2007 [ Ellington music from 1965-1973 ]. and clarinet as a sideman between 1924-1927 ]. Press, 2005) which Vail compiled ]. Jerry Valburn, "The Spotlight Bands Story: Coca-Cola's Role in Swing Music Broadcasting,"
IAJRC Journal, Vol. 40 No.4 - Dec. 2007, pp.39-50 [ a sample of Valburn's over 300-pg. manuscript which he plans to submit to a publisher in 2008 ]. News / detnews.com, Dec. 8, 2007 [ re: Vogue picture records ]. Billy Butterfield, "The Song Is You," Montpellier ( UK ) 37. = London ( UK ) LL 3058 + Decca ( UK ) TAB 33 ]. take 1 of Someday, Sweetheart and take 2 of Perdido ]. The American Society of Composers, Authors and Publishers (ASCAP) has announced its top most-performed holiday songs for the past five years, based on radio airplay. All of them in the top ten have been, at one time or another, performed by the legendary big bands. 'Tis the season! For starters, may I suggest Ralph Flanagan's Winter Wonderland, which was actually made on a summer (!) day in 1954. Listen to Vaughn Monroe sing Let It Snow! (you decide whether you prefer the 1945 or 1958 or 1962 recording). And take a Sleigh Ride with Tex Beneke from the 1965 "Christmas Serenade in the Glenn Miller Style" Columbia album.